"Stunning half-kilometer-long view of the nearby golf course..."
One important landmark that has emerged in Bonifacio Global City is Forbes Town Center, a sprawling five-hectare township project featuring 12 residential towers that will house a total of more than 3,552 units upon completion. 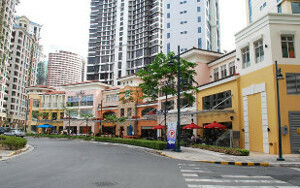 Forbes Town Center is adjacent to the Manila Polo Club, the Manila Golf and Country Club, and Forbes Park. What makes the township even more special is the stunning half-kilometer-long view of the nearby golf course, something that no other condominium in the country currently offers. Forbes Town Road within the Center is a high-end retail strip with 37 restaurants and shops that cater to the diverse needs of residents of the community's three Bellagio towers, the six towers of Forbeswood Heights and the two towers of Forbeswood Parklane. One of the posh residential towers in the Center is the Eight Forbes Town Road Golf View Residences, a modern 53-story edifice made of blue curtain glass and steel and which offers intimate views of the adjacent golf course. Eight Forbes Town Road offers 16 different amenities in its seventh-level pleasure zone—an infinity pool, landscaped roof gardens, an outdoor spa, a shallow pool with water jets, a reflexology path, a tai chi station, and a playground for children. The newest addition to Forbes Town Center is Burgos Circle, a leisure destination that caters to the younger, trendier crowd. The Burgos Circle has establishments that allow young professionals to grab a quick lunch during weekdays or have breakfast before or after their call center shifts.